Please Note: This tour is only applicable for 18 to 35 year olds. Why pay full price? Call us or click above for a quick quote and save money on Contiki Tours. Book any Contiki trip 7+ days and save 10% when you mention “student” to redeem. Plus as always receive our AffordableTours.com 5% extra savings. Itineraries must be 7+ days to qualify for this promotion. Please call your Tour Specialist for more information. Offer valid for student only. Verification of employment must be sent at time of booking to receive promotion. Must book and pay non-refundable $200 deposit. Final payment must be completed 46 days prior to departure. Discount not available on pre- & post-trip accommodation rates, diving packages, & other selected products. Discount based on availability and applies to the land portion of your trip price only (this excludes taxes, food funds, and internal airfare). Offer is combinable with Promotions and Ongoing Deals. Offer is not combinable with other Special Deals or Last Minute Deals and is not valid for Canadian residents. Restrictions apply. Contiki reserves the right to withdraw promotional offers at any time. Book a trip during your birthday month or travel during your birthday month and save $50 off on any 7+ days trip. Plus as always receive our AffordableTours.com 5% extra savings. Book any Contiki trip 7+ days during your birthday month or travel during your birthday month and save $50 when you call and mention "its my birthday" to redeem. Offer valid on new bookings during the month of your birthday only. Verification of birthday must be sent at time of booking to receive promotion. Must book and pay non-refundable $200 deposit & final payment must be completed 46 days prior to departure. Discount not available on pre- & post-trip accommodation rates, diving packages, & other selected products. Discount based on availability and applies to the land portion of your trip price only (this excludes taxes, food funds, and internal airfare). Restrictions apply. Free Passport For Your First Contiki Trip! Ready to take your first big trip? Get your very first passport for FREE when you book a 7+ day international trip with Contiki! A value of $145 that first time Contiki travelers get absolutely free! Book any international trip 7+ days and Contiki will pay for the cost of your passport. Offer only valid for US residents who are for first-time passport applicants. Offer only valid on international Contiki trips 7+ days to Europe, Latin America, Canada, Asia, Australia or New Zealand. For new bookings only made after 02APR2018. Passport cost ($145) will be applied to the booking as a discount. Passport cost that will be discounted is the calculated combined total of the application fee ($110) and execution fee ($35) for an adult first-time applicant in the United States. Information correct as of 01APR2018 based on https://travel.state.gov/content/travel/en/passports/requirements/fees.html. Contiki is not responsible for submitting the passport information or the handling and processing of the passport application. Contiki will verify, in their sole and absolute discretion, that a traveler has applied for a first-time passport per the passport details given at the time of booking or before the final payment date of 46 days prior to travel. Traveler must submit passport details before final payment date of 46 days prior to travel to qualify. Restrictions apply. It is advised not to book airfare until the trip is marked as “definite” unless the flights are purchased with Contiki. Offer is combinable with current Land Promotions & Ongoing Deals. Offer is not combinable with other Special Deals, Last Minute Deals, or Air Promotions and is valid for US residents only. Contiki reserves the right to withdraw promotional offers at any time. Feed your adrenaline cravings - relaxation is overrated! Kick it off in Queenstown, the adventure-adrenaline Capital of the World. Ride the Shotover Jet (until Sep 2018) & get a slice of the action! Ever tried bungy jumping, or luging? Now's the time! As you head North, see stunning glaciers, visit Christchurch, try a Maori 'hangi', cruise Lake Taupo & hit Rotorua to try the 'Zorb' or luge! Kia Ora and welcome to New Zealand, the land of Hobbits and an epic Rugby team, not to mention adrenalin, wildlife, surfing, beach breaks...are you hooked yet? You'll be hitting up the stunning South first, arriving into Queenstown with a free afternoon to kill. This being the adventure capital of the world though, we really doubt you'll struggle to stay entertained. Tonight you'll meet up with your Contiki Crew & fellow adventurers, no doubt swapping notes on which thrill seeking activity to tick off first. Today is yours to get acquainted with Queenstown and spend some time mulling over the activities up for grabs in the next two days. To get you warmed up, we'll be treating you to an exhilirating Shotover Jet experience (until Sep 2018), so throw those hands in the air as you fly through narrow Shotover canyons at speeds of up to 85 kph. With our last day in adrenalin city ahead of us, this is the time to push yourself to the limits and hurl over any mental barriers you've put up around yourself. Jump into #NOREGRETS spirit and conquer those niggling fears once and for all. For those who did their dash yesterday, a day staying mellow and enjoying this beautiful region will prove more than sufficient. It's times like this that you really start to work out what sort of traveller you are. And human for that matter. You might be the one trailing through wine country and doing a spot of horse back riding, or you may be that guy that crams in a bungy jump, a skydive and a heliraft & still craves more. It's your holiday - run wild as you see fit. Time to return our adrenalin levels to normal and make tracks to the wild (and often wet) West Coast and it's towering glaciers. But before we do, bridge bungy jump, anyone?Enjoying our scenic drive we'll stop for lunch in Wanaka, a pretty ski resort town situated on a lake front and dwarfed by mountains. This town is fast becoming one of NZ's most popular spots, and a trip to the 'Dough Bin' for a luscious pie should be high on the list today. Our first piece of NZ eye-candy comes in the form of Hasast Pass, beautified by ancient rainforests, small glaciers and waterfalls. Note how the scenery changes as we roll away from Queenstown through the Southern Alps. Playing host tonight is the town of Franz Josef, home to some of NZ's finest natural beauty with bushlands and glaciers that almost reach the sea. Tomorrow we'll be out and about making the most of it - who's excited? This morning will be another big ol' tick off the list as we take to the ice of Franz Josef Glacier. Want to double tick the list in gold sparkly pen? We've got a heli ride over the glacier up for grabs for an ultra special experience. Satisfaction levels on high, tonight will be topped off with story swapping and crew drinks at the local. Be sure to breathe in that fresh alpine air - doesn't it feel good. Armed with a new found appreciation for frozen water, we hop back on the coach & start making our way back to Christchurch.In the gold rush town of Hokitika we'll watch authentic carvers get to work on green jade and take a look at traditional Maori art. Back on the coach we're coastline bound to one of the islands most jaw-droppingly beautiful spots... Take in the beautiful scenery as we wind our way across the highest and most spectacular mountain pass across the Southern Alps.Tonight we'll sleep well in Christchurch, drifting off to the pleasant memories of NZ's natural beauty that seasoned our day. It’s another jaw-dropping drive up to the top of the South Island today. The coach cuts across the Canterbury Plains to Kaikoura.Arriving in Kaikoura will see us amongst a seaside settlement known for whales & dolphins, so have those cameras at the ready as we roll around the coast. We'll stop at a seal colony, where you'll struggle not to break into a collective 'cuuuute' as you watch these guys sunning themselves on the rocks.Our next drive takes us up the wild, rugged east coast and the wine country of Marlborough. Jump on the Inter-Island ferry and leave the South Island behind. Cruise through the gorgeous Marlborough Sounds, where thick forested peaks rise straight up from the sea. It’s a camera-friendly spot with picturesque inlets, remote coves and tiny beaches that dot the islands.We dock in the capital city of Wellington, where no doubt New Zealand's well-cultured capital will prove an utter delight. After an orientation through the narrow streets a night on the town will be on the cards, plus an optional dinner to start the night off as we mean to go on. Galleries, cafes, shops, street performers, vintage markets -Wellington you're spoiling us. Stroll the eclectic Cuba Street, grab some sushi & pop by the Tattoo Museum where Maori moko face tattoos and modern ink collide, or hop on a quad bike to get down and dirty. We wave goodbye to Wellington and its beautiful scenery and we prepare ourselves for our next adventure – and trust us, this one is bucket-list worthy.Known as the après-ski capital of the North island, Ohakune is a tranquil town with stupendous view. Today you have the option to go mountain biking along one of NZ's most picturesque track, "the Old Coach Rd" or spend the day bettering your skills on the slopes or generally treating yourself to all the snowy based activities on offer, then tonight snuggle down in our Special Stay ski lodge, located in prime position at the base of Mt. Ruapehu. With another day to spend in Mt. Ruapehu, we definitely have lost of bucket-list worthy experiences to look forward to.That’s right, this active volcano is the perfect source of adrenaline for those who seek our incomparably unique, NO Regrets experiences. The next two days have adventure written all over them with skiing on the top of the list. Whether you consider yourself a pro, or perhaps just an aspiring ski enthusiast, this is the perfect place for you to ‘slide’ into new adventures. And yes we do make excellent puns. These landscapes are unique, and the sights will leave you breathless as we leave Mount Ruapehu behind en-route to Huka Falls.220,000 litres (that's 58 000 gallons) of water gush over Huka Falls per second. Just let that sink in for a minute. Wild, right? Even wilder still is the Hukafalls Jet experience - a thrilling ride that will get you experiencing the full force of the falls and leave you with even more of a taste for adventure. A good thing really, given Rotorua is on the horizon…When you catch your first whiff of that .. 'unusual' sulphur smell, you'll know we've arrived in Rotorua. Famed for its spurting geysers, boiling mud pools & hot springs, gondola and speeding luge rides, Rotorua is a natural wonderland, and then some. Tonight the culture will sky rocket with a traditional Maori hāngi dinner & dance performance, and perhaps best of all, the chance to get involved in the world-famous HAKA. Tongues at the ready peeps. The day is yours to roam free. Soak in a hotspring, go white water rafting, take a canopy tour of hike up a volcano – the options are limitless and the decisions are yours. Famed for its spurting geysers, boiling mud pools & hot springs, gondola and speeding luge rides, Rotorua is a natural wonderland and then some. But don't let the allure of this place consume you, for there's a fun stop at Hobbiton village we must complete. Join us at our short visit at the land of 'Lord of the Rings', before we head to Auckland. That's right, it wouldn't be a complete experience without a stop at the "Shire".This is it! And what an adventure we've had. Say your goodbyes to your new-found family as your trip ends on arrival here in Auckland. New Zealand, we’ll never forgot you. Throughout your trip you’ll be getting your beauty sleep in cosy, warm beds in multi-share rooms, plus the chance to stay in funky sleeping pods that can be completely enclosed for sleeping and chilling out. Your accommodation will always be located in the heart of the action, with communal areas for you and your new best friends to relax and socialise. We'll get 17 of your meals, you get the rest. You can expect a healthy breakfast most mornings, as well as authentic fish 'n' chips and a few BBQs along the way. We'll also give you plenty of opportunities to try the best gourmet eats in NZ. A highly trained Trip Manager who brings your adventure to life. An expert driver who knows foreign roads better than Google Maps. Local Guides who make tourist traps a thing of the past. This is your team. Smart, friendly, fun, and integral to everything we do. 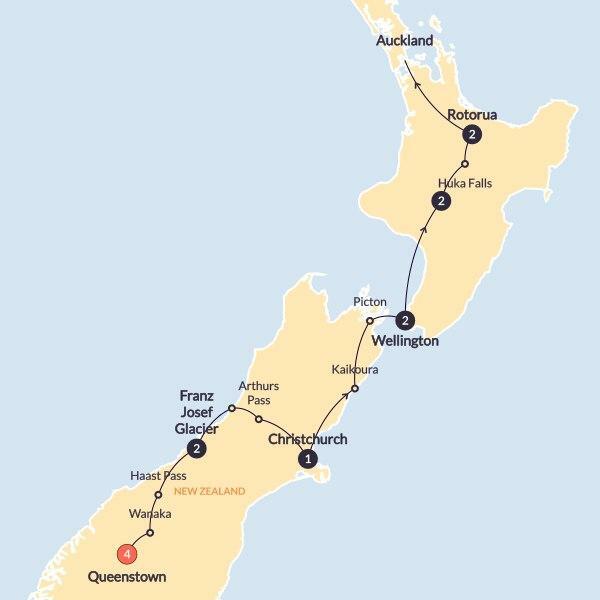 Note: AffordableTours.com is a travel agent for Contiki. All prices, itineraries, accommodations and dates are subject to change without notice and at any time by the tour operators. All prices are USD per person and based on double occupancy. Availability is limited and must be reconfirmed at time of booking. Please call us toll free at 1-800-935-2620 to confirm availability and current pricing on all our discounted specials. The prices on this website are not guaranteed until a deposit has been made. We are not responsible for errors, omissions, or changes in these prices until a booking has been confirmed by one of our agents. Some land prices may include an internal air component and discounts will not be offered on the internal air component. Discounts will not be offered on packages with a land price of less than $500.